Ukraine’s presidential election was watched with utmost attention by the international community as its outcome is bound to usher in serious changes in the domestic and foreign policy of that country, and transform the geopolitical landscape in the entire Eurasia space. The elimination of the incumbent Victor Yushchenko, who polled a mere five per cent in the first round, itself signals the marginalisation of pro-American Rightist forces for ever if you go by the pattern in the other CIS countries. This most probably will bring down the curtain on the US-orchestrated colour revolutions in the former Soviet space. The victory of Victor Yanukovich, leader of the pro-Russian Party of Regions, over the incumbent PM Yulia Timoshenko, the former Orange revolution ally of outgoing President Victor Yushchenko, in the second round promises significant shifts in Ukraine’s foreign as well as domestic policy. The euphoria of the victory is going to be over soon with Victor Yanukovich left one-to-one with the heavy legacy left by the Orange revolution leader, Yushchenko. Ukraine is in the midst of a serious economic crisis with a GDP decline of 16 per cent in a single year, skyrocketing inflation, heavy unemployment and unprecedented fall in living standards. The other part of the Yushchenko legacy is that Ukraine is on the verge of near disintegration with the eastern and southern parts of the country drifting towards Russia and the western and central parts moving towards the West. Yanukovich has to find a solution to the lingering economic crisis and save the country from the brink of disintegration, heralding national reconciliation. The foreign policy that spelt disaster for Ukraine under Yushchenko is destined to be balanced, pragmatic, multi-dimensional and predictable under Yanukovich. The US policy to contain Russia by Ukraine has come to its logical end with Yanukovich’s victory. Yushchenko, in his over-enthusiasm for Euro-Atlantic integration and curtailing Russia’s strategic significance in the former Soviet space, pushed Ukraine too far away from Russia and the CIS, and led the anti-Moscow grouping GUUAM consisting of Georgia, Ukraine, Uzbekistan, Azerbaijan and Maldova providing a heavy jolt to Russia’s strategic interests in the former Soviet space, though the grouping gradually turned amorphous with Uzbekistan withdrawing from it, and Maldova and Azerbaijan showing little or no interest in the grouping. Yanukovich’s elevation as the President would surely deliver the death blow to the organisation with Georgia—a failed state by all accounts—being left alone in it. Ukraine’s likely departure from the organisation or passive role would bring about a dramatic shift in the CIS’ geopolitical calculus. The US policy to contain Russia and prevent re-integration in the CIS with the help of Ukraine would be rendered ineffective as Ukraine under Yanukovich is most unlikely to pursue any anti-Moscow policy. It is impossible to integrate the former Soviet space without Ukraine. Yanukovich’s victory is likely to provide the much-needed impetus to the sagging re-integration process in the CIS. GUAM’s natural death would no doubt provide fodder for the strengthening of inter-state organisations led by Moscow like the Euro-Asian Economic Community, Customs Union, CSTO and others. If Yanukovich’s words while holding the post of the Prime Minister is any indication, the Single Economic Space organi-sation is likely to receive a new boost. Yanukovich in 2007, in the capacity of the PM, had highlighted the significance of cooperation in the framework of the single economic space, stressing the importance of the creation of a free trade zone under it. It is reported that Yanukovich’s supporters have started unofficial negotiations for joining the Customs Union consisting of Russia, Belarus and Kazakhstan. Ukraine’s positive attitude towards the CIS, in which it is an associate member, would no doubt breathe new life to the defunct inter-state organisation. With the Customs Union functioning from January 1, 2010, Ukraine’s accession to it will only accelerate the economic integration process in the CIS. Russian President Medvedev lost no time in congratulating Yanukovich, who has been invited by the former to visit Moscow for discussing pertinent issues of bilateral and multi-lateral importance. The head of the Kremlin staff, Sergei Narishkin’s sudden visit to Kiev in the immediate aftermath of the announcement of election results deserves attention in the context of Ukraine’s presidental poll outcome and his meeting with Yanukovich merits attention in the context of Ukraine’s foreign policy in general and Russian-Ukranian bilateral relations in particular. Moscow is likely to be the first world capital to be visited by President Yanukovich. All these indicate that the period of strained relations between the two fraternal peoples is fast relegating to the background, and we can expect to witness improved relations between the two countries on all major issues of mutual concern. No other issue than Ukraine’s bid to join the NATO had considerably vexed Russia. Ukraine under Yushchenko tried its best to join the NATO. However, the fall-out of the five-day war in August 2008 between Russia and Ukraine, in which Kiev supported Georgia with weapons and men, buried their hope for an early accession into the North-Atlantic block in contrast to their expectation that this would accelerate their entry into the Alliance. However, if you go by the declaration of the NATO leaders, its eastward expansion cannot be ruled out. NATO Secretary General Andres Rasmussen has stressed that the North-Atlantic bloc is dedicated to the ‘strengthening of strategic partnership with Ukraine’. Yushchenko’s Defence Minister Valery Ivashenko has emphasised that ‘Ukraine’s bid for European and Euro-Atlantic integration is its priority, top goal, and cannot be changed’. Russia in its latest military doctrine has emphasised that bringing the NATO’s military infrastructure closer to its borders including through the Alliance’s expansion constitutes the most serious external threat to its security. In this backdrop, Yanukovich can ill-afford to push for Ukraine’s accession to the NATO, which he can do only at the cost of losing his constituency in the east and south of the country and losing Russia’s sympathy. Yanukovich’s emphasis on a referen-dum on the vexed issue presents a smart manoeuvre as no referendum can ever approve Ukraine’s NATO membership. This by no way means Yanukovich would abandon the Euro-integration course. Indeed his metaphor that his country would be a bridge between Russia and Europe by taking advantage of the geo-political location of his country indicates that he would pursue a balanced foreign policy to suit Ukraine’s national interests. The energy issue is another irritant in Russia-Ukrainian relations that had marred their ties for years. Yanukovich has declared that ‘stability in energy supply’ is one of the priorities of his policy towards Russia. Russia has indicated that the transit potential of Ukraine would be expanded along with construction of the North stream and South stream gas pipelines. Yanukovich’s intention to connect Ukraine to the North stream pipeline would facilitate reduction of tension on the thorny issue between the two Slavic neighbours. Yanukovich’s intention to permit Russian participation in the international consortium for management of Ukrainian gas-transportation system would help further strengthening of bilateral ties. Russia has been demanding its participation in the gas transit system over these years which Kiev was flatly refusing. Yanukovich’s policy on the issue is prompted not only to please Russia but also for solid economic reasons. The new President knows well that Ukraine does not have resources for modernising the gas transport system owned by the state on its own, and may have to live with old unusable empty pipes. By selling stakes to Russian and European participants Kiev would resolve the issue of distribution of responsibility and involvement of partners in the modernisation of the system while retaining controlling stakes in the hands of the state. The future of the Black Sea fleet at Sevastopol is yet another major irritant in Russo-Ukrainian relations. The new President is likely to find a solution of the issue to the satisfaction of both sides. The agreement for continuation of Russia’s Black Sea fleet at Sevastopol would expire in 2017 beyond which the Yushchenko Government was unwilling to permit the Russian fleet in the territory that is historically Russian. This territory, home to the Russian fleet for centuries ever since its inception, was gifted to Ukraine in 1954 by the then Soviet leader, Nikita Khrushchev, himself an ethnic Ukranian, for commemorating 200 years of unification of Ukraine with Russia. Russian sentiments are extremely strong on the issue. Yanukovich is ready to accommodate Russia on continuation of the Black Sea fleet at Sevastopol, which would no doubt help warming up bilateral relations. One of the thorny issues between the two neighbours was the status of the Russian language in Ukraine. Yanukovich’s poll programme that promised to provide legal status to the Russian language had evoked positive response from Moscow. Yanukovich has pledged to pass a language bill that would permit unhindered functioning of the Russian language in official transactions, education, medicine and jurisprudence. Yanuko-vich’s Party of Regions has been campaigning in favour of approving a law on the Russian-speaking people in March and April so that it can come into effect from the beginning of the next academic year. This proposed law would provide opportunities to deliver education in the Russian language according to the wishes of the parents of the pupils along with compulsory study of the Ukrainian language. The bureaucrats at the local level would be obliged to know two languages and prepare documents in both the languages. The magnitude of the issue can be judged in the backdrop of the fact that the Russian-speaking people constitute the majority in Ukraine. Opinion polls suggest that 37 per cent people in Ukraine consider Russian as their native language while another 34 per cent consider both Russian and Ukrainian as their native language and only 28 per cent consider Ukrainian as their native language. In spite of a five-year long anti-Russian campaign, 54 per cent of the population are in favour of giving equal status to the Russian along with the Ukrainian language. The new President is likely to pursue a balanced policy in this area. The first step towards clearing the mess has been taken with the Supreme Court annulling the controversial bill introduced by the government to ban use of the Russian language in educational institutes. The status of the Russian language was at the heart of the controversy during the last five years of Yushchenko’s rule. While Yushchenko was doing everything to throw the Russian language into the dustbin, Yanukovich would pursue a rational policy on the issue. There are enough indications that Russian-Ukranian relations would grow from strength to strength under the new establishment in Ukraine. 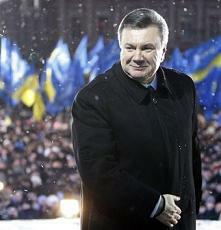 However, there are skeptics who believe that Yanukovich may not live upto the expectations. In this context they recall the post-Soviet history of Ukraine, which had a total anti-Russian President in the person of the first President, Leonid Kravchuk. Leonid Kuchma defeated Kravchuk on a pro-Russian platform but did precious little to improve bilateral ties contrary to the expectations. Yushchenko was an absolutely anti-Russian President who did everything to inflict damage to Russian interests on any possible issue and anywhere. Yanukovich won the latest poll battle on a more or less pro-Russian platform, but might follow Kuchma’s path. The skeptics draw attention to the fact of Yushchenko’s close allies extending support to Yanukovich in the second round of poll and predict that decisions taken on key issues would always favour Russia. They recall that Yanukovich in the capacity of Prime Minister did precious little for giving the Russian language the status of the second state language though he had enough possibilities. If Yanukovich’s declaration that he would be President for all Ukrainians is any indication, he might pursue policies for appeasing the people living in the western and central regions where anti-Russian sentiments run very high, for the sake of keeping the country’s unity. According to Russian commentator Stanislav Belkovsky, it would have been easier for Russia to find a common language with Yulia Timo-shenko who takes decisions on her own contrary to Yanukovich who represents the interests of big capital oriented towards Ukraine’s independence and is likely to pursue a pragmatic policy. The business and political elite around Yanukovich are believed to be more pro-European for the simple reason that their business is in Europe, their children study there, they have their money in European banks and they go to Europe for taking rest. That is why the hope that Yanukovich would do a U-turn in foreign policy and pursue a pro-Russian policy could turn out to be misplaced. The author is an Associate Professor, School of International Studies, Jawaharlal Nehru University, New Delhi. He is also the Director, Eurasian Foundation.